Our company has the facility to develop casting products with the help of drawings made available by the customers. Neelam Casting & Alloys manufacture castings by using materials like steel casting , cast iron, S.G iron, alloy steel casting, stainless steel casting etc. Neelam Casting & Alloys also provide certificates along with the products that hold the material composition of the product. At our premises Neelam Casting & Alloys take care of all stages of casting development that includes mould, casting and final machining in accordance with the requirements of different industries. 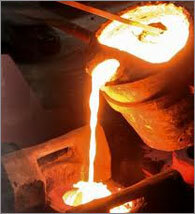 Neelam Casting & Alloys are manufactures machined Steel casting upto 1 Ton single PC as per customer requirement. The major products includes Rolling mill parts Crusher Parts, Auto Pats, Power Plant Parts, Cement Plants Parts, Valves, Bottom plate, Alloy steel casting. Steels are divided into carbon steel and alloy steel. Carbon steel offers low cost and can be hardened. A major disadvantage is the lack of resistance to corrosion. Alloy steel is elements like stainless steel, and elements other than carbon. Steel gears offer high strength and a wide range of heat treatment properties. 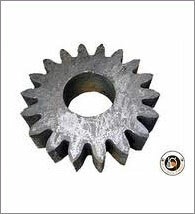 Steel gears provide highest strength and durability. Stainless steel may be stainless steel (austenitic) that is non-magnetic and has good corrosion resistance; they may be of stainless steel (martensitic) that can be easily hardened by heat, is magnetic and have reasonable corrosion resistance. Stainless steel (aust) can be used where low power ratings are there and the other stainless steel is used where low to medium power ratings is there. 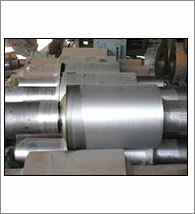 Alloy steels are used in industrial field. Industrial gears and wheels which Neelam Casting & Alloys manufacture are toothed wheels which are used to transmit motion between two shafts or a shaft and a component having linear motion, by meshing of two or more gears. These industrial gears have advantage over other drives like chains, belts , Reduction , pinion etc. These gears and toothed wheels are available in various sizes and can be customized as per needs and requirements of client.